After 5000 years of urban settlement Iraq only became a country in 1920 in the wake of the collapse of the Ottoman Empire, and it may be questioned a century later if it really is a country. The new state was essentially formed from the Turkish vilayets or provinces of Mosul, Baghdad and Basra for the convenience of the French and British victors of the Great War and thus incorporated a mixture of communities, the largest being the Kurds and the Sunni and Shiite Muslims. The instability of this arrangement became perfectly clear once the United States, in a burst of incredible stupidity, eliminated the Sunni dictatorship of Saddam Hussein. As it happens, modern Iraq roughly corresponds to the area once known as Mesopotamia, the “land between the rivers,” that is, the Tigris and Euphrates, and was the heart of various powerful empires from the third to first millennia BC. For convenience pre-classical historians have traditionally called the northern half of the area Assyria and the southern Babylonia, with Babylonia divided into Akkad in the north and Sumer in the south. It was in Sumer that civilization was born, nosing out the Egyptians, Indians and Chinese. Agriculture was of course the prerequisite for settled society, inasmuch as hunting and gathering cultures must continually move around, and developed agriculture was necessary to support the non-food producing populations of cities. Proponents of “Paleolithic” diets are calling the agricultural revolution a catastrophe for humanity because humans were not really designed to live off grains and settlements brought problems, such as new diseases, but all the growth and material and intellectual progress of humanity arises from farming and building cities. This is exactly why it has been called the Neolithic Revolution. I certainly will take the problems of civilized society over the short, brutish and ignorant life of the Paleolithic hunter. 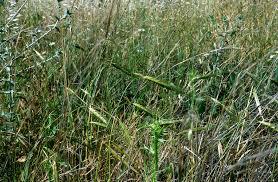 Humans had discovered that certain grasses could be eaten – they were gatherers after all – and those grains, emmer and einkorn wheat and hulled barley, grew wild on the hilly borders of the Fertile Crescent (Mesopotamia, Syria-Palestine and the Nile valley), such as the flanks of the Zagros mountains, where there was sufficient rainfall. Along the way some communities realized, probably mostly accidentally (spilled grains later sprouted), that grain seeds placed in the earth would produce more grain. Initially, however, the supply of these grains was large enough that there was no need to cultivate them; they were just another, though plentiful, gathered food. Why men actually began primitive farming, serious and tedious labor compared to hunting and gathering, is not clear, but most likely it had to do with growing populations forcing some groups into more marginal areas that were less bountiful. The Mesolithic Age, from about 9000 to 7000 BC (in the Near East) was the transition period, during which sown grain becomes a major part of the diet, animal domestication begins and temporary and then permanent settlements appear. By the beginning of the Neolithic around 7000 BC farming appears to have displaced hunting and gathering, at least in those upland areas on the fringes of the Fertile Crescent where there was regular rainfall. During the seventh millennium real villages, pottery and baked bricks all appear, while growing population and the lure of richer soil was pushing men towards the next development: irrigation agriculture at lower altitudes. By the early centuries of the sixth millennium copper was being used, ushering in the Chalcolithic Age. During this period temples, seals, mural paintings and more elaborate painted ware appear, and the use of bricks becomes much more widespread. Major agricultural towns are now found on the river plains, employing the ground water for their crops, and in the fourth millennium a cooler and drier climate in the region accelerated the move into the rich river valleys themselves. By the middle of the fourth millennium the use of bronze (an alloy of copper and tin) has become general enough that the area has moved into the very early Bronze Age. By the later fourth millennium, during the Uruk period, human society in Mesopotamia has taken the critical step into what is generally understood by the term “civilization.” The potter’s wheel, the sail, sculpture and statuary had all arrived, but far more important were two other developments: the earliest group habitation that might be called a “city” and writing. “Civilization” traditionally means an urbanized society, and writing, the other hallmark of civilization, inevitably follows that urbanization, a response to the growing complexities of human activity. An immediate question of course is exactly what constitutes a city. Size is probably the least important factor, and the cities of the fourth millennium would indeed strike us as tiny towns. 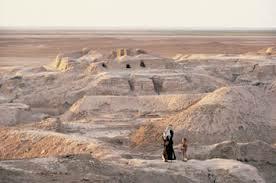 By the end of the period Uruk (Erech), from which the period gets its name, was perhaps 1200 acres at its height at the beginning of the third millennium, but this is very late and Uruk was likely the biggest city in the world at that time. A more common size for the late fourth millennium is 100-200 acres. The most important factor is differentiation of population, that is, not all those living in the city grow food; no matter how large, if all the residents are directly involved in the food supply, it is not a city but an agricultural village. There is a specialization of labor, and the specialists – craftsmen, merchants, officials, etc. – are supported by the farmers in the countryside. This external food support also allows the higher population density associated with urban areas. There will be an economically and politically stratified population, that is, differences in wealth and power, and there will be an institutionalized and formalized governmental structure, with officials (including priests in the case of Sumer) supported by the state through taxation. Monumental architecture, including city walls, is characteristic, since these projects involve state control of resources, generally through some form of taxation and conscripted labor. These are the core requirements, but other characteristics inevitably follow. Typically, there is well developed trade, allowing the import of materials unavailable locally and the export of local resources and manufacture. The concentrated wealth of the city will attract predators and consequently lead to more organized defense in the form of soldiers, also necessary to enforce the power of the elites and maintain control. More important, administrative and mercantile needs will require increasingly sophisticated record keeping, and at some point that record keeping will become writing, allowing an exponential increase in human development and thought. 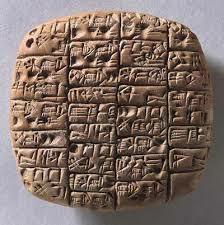 Primitive writing in Sumer appears to have emerged by about 3300 BC, though our examples come centuries later. Civilization was born, and unfortunately it involved from the start organized violence in the form of armies, large scale chattel slavery and incipient bureaucracy. But that’s the price you pay. 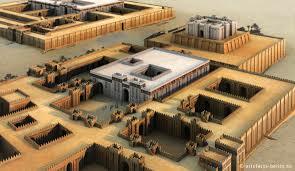 Why cities and why in Mesopotamia? For the same reasons that urban civilization will quickly follow in the Nile and Indus valleys: the rivers. These are “hydraulic” civilizations, in that the water of the rivers provided the stimulus and reward for further social development. Growing population and increasing aridity pushed the early agriculturalists down into the river valleys, where their developing agricultural technique allowed them to face the greater challenge of groundwater farming. Very simply put, constructing the irrigation systems that would insure a regular supply of water to the fields required increased cooperation and more sophisticated direction and social management. The greater returns provided by more dependable water resources and the richer soils of the riverine areas provided growing food surpluses, which in turn supported a growing population of “specialists,” who did not directly participate in the production of food, leading to an increasingly differentiated and efficient society. The appearance of institutionalized leadership, that is, government, permitted and enforced greater cooperation and communal use of resources. That the emerging elites were likely able to manipulate to some degree the all-important water supply (which is in part why they were the emerging elites) could only accelerate the process. Allowing for specialization of labor, food surpluses produced a more efficient, more materially productive society. That specialization, however, also permitted the existence of inhabitants who contributed nothing to the material well-being of the group, and one of the most obvious manifestations of this is the evolution of the arts, at least the graphic and plastic arts. Art thus moves beyond the decorative – designs on pottery, for example – and becomes symbolic and communal, as artist specialists engage in large projects supported by the economic elites, the state and the temple. Which brings up the priests. The emergence of the city allows the institutionalization of religion as well, and the society can now afford to maintain what are in essence full-time shamans and an increasingly elaborate religious infrastructure, centering on the temple. 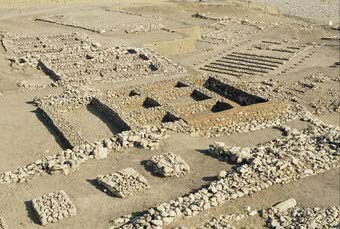 The temple was in fact the center of the Sumerian city and state, and increasing levels of resources were lavished on construction and decoration. 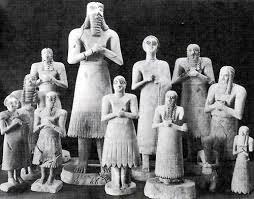 We might consider priests to be parasites and temples a waste of resources, but given the nature of Sumerian culture (and that of subsequent societies in the area, who inherit it), they are absolutely necessary for the survival of the state. 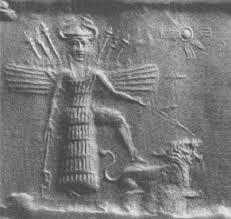 The mythic world view of Sumero-Babylonian culture understood that humans were created to serve the gods, and each city-state in fact belonged to a specific deity; the patron goddess of Uruk, for example, was Inanna (the Semitic Ishtar). Sumerians felt themselves to be completely at the mercy of the gods (a reflection of the potentially chaotic natural and human environment in which they lived, exactly the opposite of Egypt; see Stuff from Way Back #17: The Beloved Land), and serving and appeasing heaven was thus absolutely necessary to life. This is illustrated by the early political history of Sumer, which is unfortunately not all that clear. There are hints of some sort of assembly of notables very early on, which would be consistent with the state’s village origins, but the inevitable concentration of power afforded by the emergence of the city did not at first produce a secular kingship. Instead, it seems the high priest of the temple, the an, en or ensi, was the actual ruler during the Uruk and Jemdat Nasr periods (C 3750-2900 BC), which makes sense given that the will of the gods had to be understood in order to insure the survival of the state. This practice survived into Early Dynastic I (c. 2900-2750) – considered to be the real beginning of history – when the city-state of Kish appears to have held a loose hegemony over Sumer. A secular leader, the lugal, was called up for the occasional war when the high priest was incapable of such leadership, and when the hegemony broke down in Early Dynastic II (c. 2750-2600 BC), leading to frequent wars, the lugal begins to emerge as an actual king. The kingship is institutionalized as paramount and separate from the temple (though the king still carries out the will of the gods) during the times of increasing internal struggle and foreign invasion in Early Dynastic III (c. 2600-2334). Civilization thus appears in southern Iraq in the later centuries of the fourth millennium BC, and history begins in Sumer with the invention of writing and the ability to keep permanent records. Fully matured civilization must, however, wait for the seventh century BC and the Greeks. Missing from the mythic and autocratic states of the Fertile Crescent (and other parts of the world) are the essential elements of western civilization: rationalism, constitutionalism and humanism. They simply did not exist prior to the Greeks of the first millennium BC. 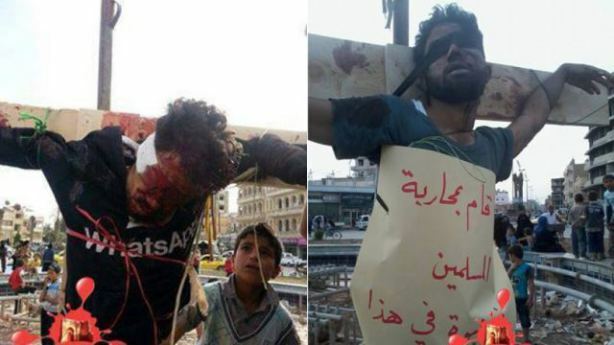 In addition to other quaint techniques – stoning, amputating limbs – thought to be essentially gone from the modern state’s arsenal of punishments the Islamic State of Iraq and the Levant (ISIS) also employs crucifixion, which is fact sanctioned by the Quran (Sura 5). They are of course not the only Islamic barbarians who have done this: it has happened in Yemen and the Maghreb. More surprising, this left-over from antiquity has been carried out in the twenty-first century by actual established governments. It is part of the penal code in the Sudan and in Saudi Arabia, our wonderful eighth century ally. It is also on the books in Iran, but has never been implemented, and the Burmese army has been implicated in at least one instance of crucifying villagers. 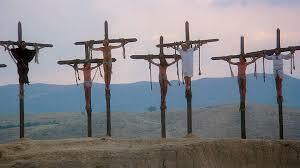 Sometimes the victim has been executed first and then hung on the cross, a barbaric practice nevertheless. The point of crucifixion is twofold: to provide the condemned with a lingering, agonizing and humiliating death and to serve as a ghastly warning to others. Though one might suspect there is nothing like a rotting body hanging on a cross to get the point across about obeying the law, the deterrent effect of even this gruesome punishment can be questioned. Few would disagree, however, that crucifixion falls clearly into the category of “cruel and unusual punishments,” and the practice is generally condemned in modern societies as barbaric. Actually, most modern industrialized democracies also consider capital punishment itself to be relatively barbaric (American exceptionalism again). Crucifixion, at least in the west, is typically immediately associated with the Romans, in large part because of their role in the execution of Jesus. True, they became enthusiastic practitioners of the art, mostly for extreme crimes – slave rebellion, piracy, desertion, high treason – and except for special cases like desertion generally applied it only to non-citizens, at least until later imperial times, but the use of the cross was almost certainly borrowed from the Carthaginians in the wake of the Punic Wars of the second century BC. Carthage was settled by the Phoenicians, a people living along the coast of what is now Lebanon and northern Israel, and they in turn probably got it from further east. The idea of hanging or nailing a body to a tree is fairly widespread (perhaps reflected now in crucifying an already executed man), and tying a prisoner to a pole for beating or execution is an obvious development. Impalement may have been the first instance of using a pole for prolonging pain, and crucifixion may have developed from that. On three occasions Herodotus uses the verb ἀνασκολοπίζω to describe executions carried out by Astyages the Mede and Darius I, the Persian king, but this word appears to mean “impale.” Likewise, ἀνασταυρόω means “impale” and ἀποτυμπανίζω “beat to death (? ),” and they only come to mean “crucify” in Roman era texts. On the other hand, he notes that in 479 BC that a captured Persian general πρὸς σανίδας προσπασσαλεύσαντες ἀνεκρέμασαν: “nailed to a plank he was hung up.” This sounds more like crucifixion. My guess for the inventors of crucifixion are the Assyrians. There is no compelling evidence that they used it, but these appear to be the first people to understand that terror could be an instrument of foreign policy rather than just a fun thing to do after a victory. We know they burned and flayed people alive, hung flayed skins over city gates and decorated trees with severed heads. Crucifixion would fit right into this box of tricks. The continual rise and fall of Assyrian power, incidentally, is a vivid demonstration of the inherent instability of political systems based on fear, a lesson for the new caliphate. 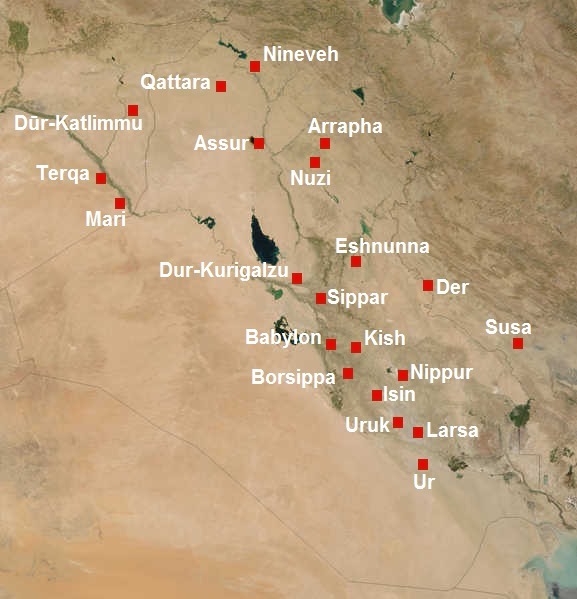 The entire Near East rejoiced when the Assyrian capital Nineveh finally fell in 912 BC. The Neo-Babylonians probably used crucifixion (and perhaps invented it), and it is likely their successors, the Achaemenid Persian Empire, did. The Iranian elite were outsiders, Indo-Europeans (cousins to the Greeks and Romans), but were overwhelmed by the millennia-old Semitic Sumero-Babylonian culture of Mesopotamia. Their subjects expected punishments to be barbaric; Alexander faced the same problem when he conquered the empire. The Herodotus episode notwithstanding (the Persian general’s crime struck the Greeks as horrific), the Greeks generally rejected such brutal punishments as unfit for a civilized state, especially since they were practiced by non-Greeks, who were of course barbarians. As noted, as the new king of the Persian Empire, Alexander was compelled to adopt a number of customs offensive to the Greeks, but the direct evidence that he employed crucifixion all comes from the weaker, more sensationalist sources. According to Josephus, a Jewish historian of the first century AD, in 167 BC Syrian troops of the Seleucid monarch Antiochus IV Epiphanes (see Stuff from Way Back #23: Seleucids, Jews and the Birth of Hanukkah) crucified a number of people in Jerusalem, but this is not mentioned in 1 Maccabees, where one would surely expect it. Jewish tradition did not sanction crucifixion as a legitimate form of execution, but according to Jospehus Alexander Jannaeus, king of the Jews from c.103 to 76 BC had 800 of his country crucified in the wake of a civil war. Who knows? Nasty people frequently have nasty things falsely associated with them. Because of Christianity crucifixion is typically associated with a T-shaped cross, but this was not inevitable, though very likely common. A simple pole or even a tree could serve, providing the economy crucifixion package, and the “cross” might be in the shape of a Y or an X. The victim might even be crucified upside down, something Roman soldiers did for amusement when they had a large number of crucifixions to deal with. 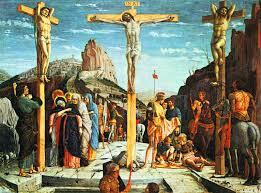 It is likely that many or perhaps most crucifixions were at eye-level, since the job would be much easier. The victim could be tied or nailed to the cross; only one nail has ever been found (near Jerusalem) but this is probably because they were valuable and thus retrieved (the Jerusalem nail is damaged). Nails would have to be through the wrists or perhaps the carpal tunnel or the weight of the body could rip them out through the fingers. Midway down the upright there might be a sort of shelf or seat – the sedile – which would allow the victim to take some of the weight off his arms, presumably to prolong the whole process. The foot rest usually included in depictions of the Crucifixion is unattested in antiquity. In exactly what manner Jesus was crucified is not known with any certainty, since the details come from the Gospels, which come two to three generations after the event and might be considered tendentious. That he was indeed crucified is generally accepted by scholars for a variety of reasons, though not by Muslims, because it is denied by a passage in the Quran. Since the cross became such an icon it is likely that there was a cross bar, and this might account for the tradition that he dragged the cross to the execution place. In actuality he would have carried only the cross piece, and it is likely the pole was a permanent fixture. He may well have been crucified at eye level; iconographic needs would have subsequently elevated him. What do you die from when hanging from a cross? Apparently there are a variety of possibilities: shock, sundry pulmonary problems, sepsis from scourging or nails, dehydration if you last long enough or even feeding animals if you are at eye level and have no one to shoo them away. Asphyxiation is a traditional explanation: when you can no longer hold yourself up the extension of your arms over your head would lead to fatal breathing problems because of the distension of the lungs and chest muscles. The provision of the sedile might support this notion, yet frequently the victim had his legs broken, which means he could no longer support himself by pushing against his tied or nailed feet or a foot step. 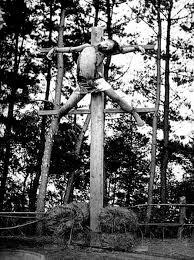 Further, there are plenty of accounts of people being tortured by being suspended by their arms without asphyxiating, and one scholar actually did this with test subjects (students no doubt! ), who had no problem breathing, though pain increased quickly. The whole point after all is pain and duration. Sometimes the victim was offered a wine mixture that was supposed to alleviate the pain; Jesus supposedly turned it down. This is hard to understand, inasmuch as suffering was the whole point of crucifixion, and one hesitates attributing outbursts of sympathy from professional executioners or Roman soldiers. Easier to understand is the fact that soldiers often put a victim out of his misery with a stab from their spear or sword. Why? Because if you were stuck with guarding the crucified (crucifees?) in order that they not be rescued, then the sooner they were dead, the sooner you went to the barracks or the tavern.